Thoroughly cleaning your pool on a weekly basis during the swimming season will ensure clean and safe swimming water. Use a long-handled leaf skimmer to gather up leaves, insects, and any other debris floating on the surface of the pool. Try to remove debris before it sinks to the bottom of your pool where it becomes difficult to remove and may create stains. Use a brush to remove dirt that has collected on the sides and bottom of your pool. Brush sediment toward the main drain so it can be easily vacuumed. Submerge your vacuum head and hose, before hooking up the vacuum to the filter. You should also clean out your skimmer(s) weekly or more often if necessary. Removing debris allows the skimmer to operate at maximum efficiency. Your pool”s circulation system includes the skimmer, pump, pump strainer, drains, and filter. The system helps chemicals work effectively and ensures that water is properly filtered. Run your pump long enough each day to make sure the water is properly filtered and keep each item clean and in good condition. Test your pool water frequently (daily or weekly depending on use) and add chemicals if necessary, following manufacturers” directions. A regular shock treatment cleanses the water of algae, bacteria, dirt, and any other organic matter that may have entered the pool. Follow manufacturer”s directions for shock treatments. 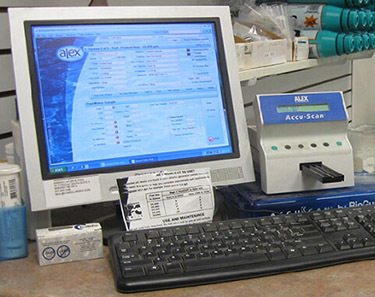 We offer FREE computerized water testing in our store so stop in any time with a sample of your pool water.